The customizable item type "Card" can be used to keep any structured data in separate fields - useful with bank accounts, insurance policies, memberships, and other information. 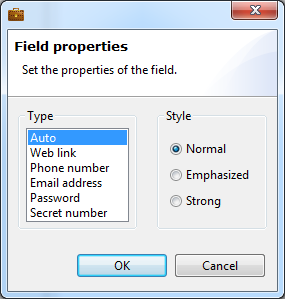 Each field can be copied easily which is useful when filling out web forms. Setting the Style of specific fields allows for easy spotting of the most important ones. Setting the Type of specific fields (like web links, phone numbers and email addresses) provides appropriate actions when clicking these fields. If more than one instance of a specific kind of Card is needed, a template can easily be created. 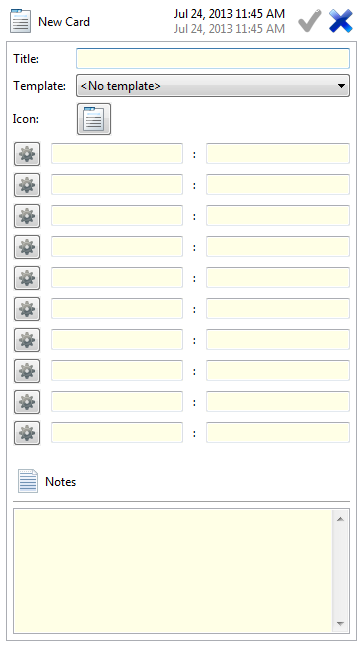 When we create a new Card, all fields are empty and the default icon is displayed. The icon can be changed by pressing the icon button. Each field is a pair of two components: label:value. For each field, Type and Style can be set individually by pressing the gears button. Here is an example using a Card for keeping software license information. The Title, Icon, six fields, and some Notes have been filled in. After saving the Card, only the fields being used are displayed (in their specified Styles). 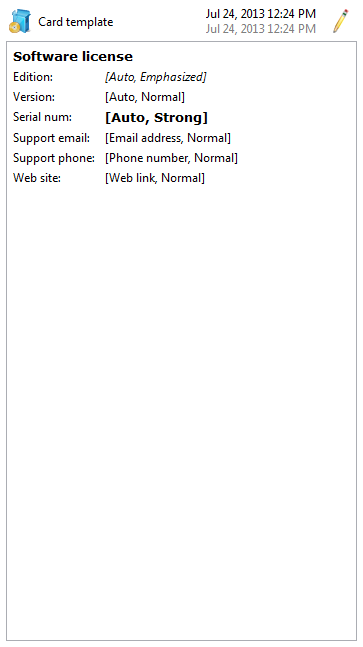 The last three fields in use have appropriate Type selected so when clicking them, the appropriate application will open to perform the task: dial the phone number, open the web link, etc. Continuing the example, if more software licenses are desired, creating a template saves set-up time. 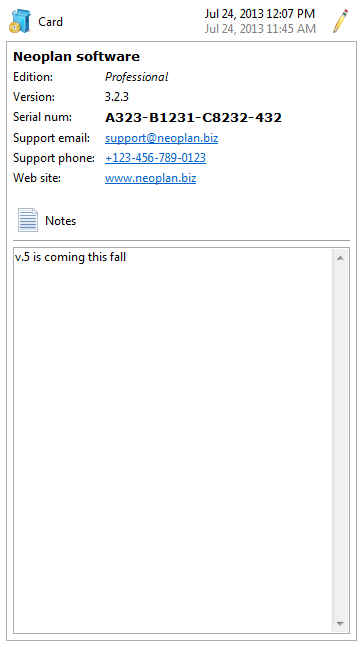 A template is created by using the Save as Card template command (available from the context or Actions menus). 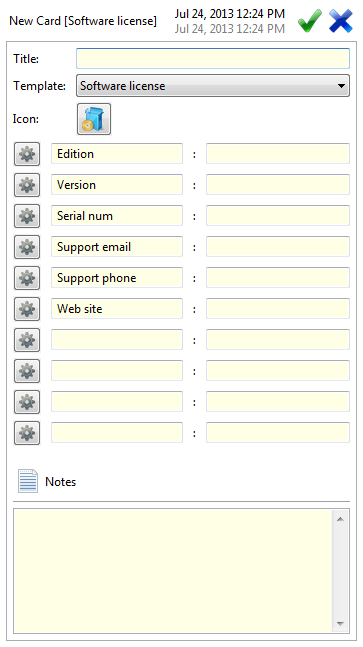 The created template can be viewed using the Edit Card templates command. Note that the Type and Style of each field are displayed in square braces. 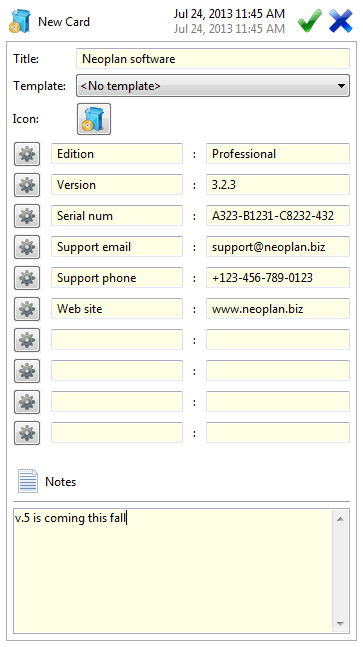 In the Folders view, when a new card is created and a template selected, each field and the icon are automatically set. You need only to fill in the title of the Card and the value of each field. The label, Type and Style of each field are copied from the template. NOTE: when you change a template, you will be asked if you want to apply those changes to all Cards that are using that template.